How I recreated BA Club Europe on easyJet for £107 one-way! I was in Gatwick’s North Terminal last Thursday reviewing the new Club Aspire lounge – that report will follow soon once we’ve edited the accompanying video. Rather than go through the hassle of getting a Gatwick North airside pass, I decided to tie in my visit with a planned trip to Paris. This meant that I would need to fly easyJet for the first time in about 18 months as it is the dominant airline in the North Terminal. I thought I would see if it was possible to recreate the British Airways Club Europe experience on easyJet and how much it would cost if I did. No particular reason why, but it seemed a good idea at the time. In the end, it came out at £92 for the one way trip, although that would have increased to £107 if I didn’t have lounge access via Priority Pass. The base fare for the flight could have been a little cheaper had I booked further out than 16 days in advance. Here is a very handy tip. Premium Security – bookable here – costs £5 per person at Gatwick North. However, for the same price of £5 you can pre-book your slot in the No 1 Lounge at Gatwick North via this link and this comes with premium security for free. If you have a Priority Pass or other lounge access card, it is pointless booking Premium Security on its own. Reserve your No 1 Lounge visit for the same £5 price and forget any concerns about the lounge being full. If you don’t want or need to pre-book your lounge visit, you can get £1 off Premium Security most of the time by registering for MyGatwick and searching through your tailored offers. We’ll talk about the Club Aspire lounge later in the week, but it was OK. The No 1 Lounge on the floor above is better but busier. Club Aspire clearly isn’t the same scale as the British Airways lounges in Gatwick South which we reviewed here, which are arguably better than those at Heathrow. The No 1 Lounge comes close though. Subject to capacity I could also have used my Priority Pass at My Lounge, reviewed here. On British Airways I would have boarded in Group 1.
easyJet gave me Speedy Boarding. There was a dedicated Speedy Boarding line and it was well policed. On landing I was first off the plane but the use of buses to get us into the terminal in Paris meant that I ended up about 20th in the passport queue. I was in 1C. On British Airways I target 1C or 1D. The difference here is that 1B was filled, so there was the usual jostling over the armrest. Because easyJet charge a chunky premium to sit on the front row, you probably won’t get this on a non-peak flight. As it happened, my flight was TOTALLY full and easyJet was asking for volunteers to take €500 plus a free taxi to get the 4pm flight from Luton (8 hours later!). They found two takers. I did check to see if I could get a last minute Avios redemption on BA around noon but there was nothing bookable and I wasn’t prepared to lose eight hours of a short trip. The upside of easyJet is that you get a far wider variety of food and drink than you would get on British Airways. I have to say that the bacon baguette was pretty good. It is only a shame that the crew don’t remove it from the plastic wrapper for you. It would have cost £7 to add a 200ml BA-sized bottle of prosecco. Champagne is also available but only in large 375ml bottles (£16). What have we learned from this important state-of-the-nation experiment? Not much, obviously. If there is a lesson, it is that the low cost carrier experience does not need to be low quality if you, erm, spend more money so that it isn’t so low cost any longer …. In the end I spent a notional £107, and £92 of real money. British Airways Club Europe flights seem to start at £141 one-way (Heathrow to Paris) and – given the empty middle seat, Avios, tier points and the fact that Heathrow T5 is simply a more pleasant place than Gatwick South – I would probably choose the BA route if £107 vs £141 was the option on the table. Coming home, of course, I took Eurostar which beats the plane any day …..
PS. By coincidence, 24 hours before I flew to Paris, Anika was in Gatwick South. She was trying to get a Club Europe-style experience on Vueling, by paying a 300% premium for Vueling Excellence. It all went wrong as you will find out soon …..
Great article, EasyJet should create an all-in-1 “Club EasyJet” experience bundle. I get all my CE flights on Avios so won’t be going down this route. EasyJet service in-flight service is good but you are sharing crew with the entire cabin. In CE you have dedicated crew serving a small number of customers = quicker service, easier top-ups etc. Interesting. I’ve done something similar a couple of times with Easyjet. What I like about the ‘pay as you go’ approach with the budget carriers is that you don’t feel almost duty-bound to make the most of all the extras you’ve paid for. For example, if you don’t feel like a glass of champagne then you don’t need to have one. If you don’t have time to relax in a lounge then you don’t have to. I’m trying a similar exercise on Flybe in August travelling to Milan. How different can it be from CE on BA Cityflyer? I have easyJet Plus, Flight Club and Priority Pass so the whole experience works for me with one problem – my easyJet ‘base’ is Manchester, where the lounges are notoriously difficult to get into with PP – the airport uses PP holders as nothing more than an off peak income stream these days. If they did the Gatwick £5 guaranteed entry thing I’d have the easyJet experience cracked. Apart from the lounges, I don’t mind easyJet at all. They’re much more mainstream than they used to be. Agree re Manchester but I think you can pre-book with PP for £5 pp? 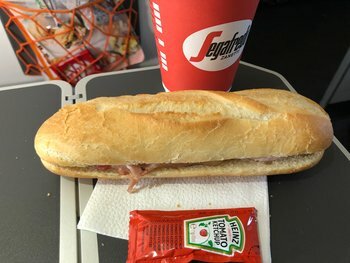 Wow…you put the baguette on the tray table without something to stop it touching at the ends. I’ve got two little kids, once you’ve spent a couple of years elbow deep in poo, blood, vomit etc your tolerance to infection gets very high …..
There’s nothing wrong with that. Totally off topic. 99.999999999999999% of bacteria are non-pathogenic. In fact, the amount of bacteria your body carries is higher (in number) than your own cells. In weight, it’s about 1-2 kg. Ther are very interesting diagrams on the web showing how many bacteria your body realesases by just lifting an arm. The real problems is viruses, but there’s not gonna be an infectious load on a table/tray. If you ever get sick on a plane, it’s probably because one of your neighbours was carrying the disease, symptomatic or asymptomatic. That’s cheered me up then. It;s fine if they hand it back at the foot of the steps. But mostly in Europe you’ll end up having to wait at the luggage carousel inside the terminal which can easily add 45mins plus to your journey. that’s why people don’t want to accept even the offer of handing in their luggage to go free into the hold at the bottom on the plane’s steps. I agree. bmi regional used to do that, even at LHR. Nobody seemed to mind much, as long as they could retrieve laptops etc. first. This! Several times on domestic flights in the US, I’ve handed over my hand luggage and always got it back as you leave the plane. No problem with that. However, on KLM, if you get a CityHopper flight (usually a Fokker 70 or similar) they take the bags off you as you leave AMS, and then you wait up to an hour at the carousel at LHR. I had breakables in my case once – it appeared on the carousel with a large case on top of it! I actively avoid CityHopper flights now, and I’ve still be asked to give up my hand luggage – I decline telling them I’ve specifically chosen a non-CityHopper flight for a reason! Nice coincidence. I was also at Club Aspire in Gatwick North last Thursday afternoon. I even checked your reviews of the No 1 and My Lounge on the way to the lounge block to see if you’d made a recommendation! For what it’s worth I found the lounge to be pretty poor and quite crowded – only instant coffee, poor snacks, a bit dark – certainly nowhere near the level of the Heathrow lounges. That said it is free with a PP card. I thought the My Lounge upstairs looked nicer. Did not go into the No 1 lounge. OT: Is it possible to book a BA reward flight on Qantas but actually end up flying Emirates but earn BA? I know this can be done in cash. I know you can book a QF codeshare operated by EK with cash and, as long as your flight is ticketed as QF, then you can earn Avios and TP with BA. Whether this is good value or not is a different matter. Usually I’ve seen the QF coded flights (on QF website) operated by EK are more expensive than EK ticketed flights purchased on EK. I’m fairly certain you can’t book a reward flight on QF using BAEC Avios and earn points. Reward flights don’t earn any TP or Avios. OT, but using Dragon Pass is there any scheme at Manchester where you can buy guaranteed access to the Escape or Aspire lounges? Flying from T1 in September and never can seem to get into the Escape lounge as it’s “too busy” with pre-bookings (even though it looks quiet each time I’ve looked inside). If the flight is not totally full, there is the trick of waiting for either an aisle or window seat to be taken on the front row then booking the other, leaving the middle seat empty on the basis that no sensible person would be top-money to sit in a middle seat between two strangers and that it will be the last seat easyJet will allocate for free. If you are two people, you can make two separate bookings and choose window and aisle seats on the front row to the same effect. Separate bookings are required because airlines have caught-on to this practice and increasingly charge extra to leave a middle seat empty – even though it does not guarantee that it will remain empty. Think some of you unlucky enough to live in the southeast fail to bear in mind that fir those of us living in better parts of the country, direct CE is not an option and U2 or others giving options for a similar experience are way better. I would actually pay more for a CE like experience both ways direct with U2 versus via LHR with BA. yep but the South West is a bit of a wasteland – a few flights from Bristol but Exeter & Bournemouth are useless – don’t mention Newquay which I would love to be an international hub as it’s just down the road, but it’s dead. Plymouth closed. This has been my experience for some time. I have an easyJet Plus card. Alongside Priority Pass (also via Amex), this provides a fairly premium experience. Caveat YMMV, though: some Speedy Boarding queues are better policed than others. MAN can be pretty poor, in this respect. My only complaint is that the Plus card doesn’t seem to work when booking a holiday with them (at least no obvious way to enter it, when doing a dummy booking).